Relying on Your goodness, O God, we humbly ask you, by the intercession of Your servant, Saint Lucy, to give perfect vision to our eyes, that we may serve You for Your greater honor and glory. We pray for the salvation of our souls in this world, that we may come to the enjoyment of the unfailing light of the Lamb of God in heaven. 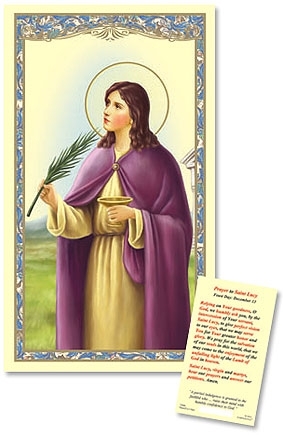 Saint Lucy, virgin and martyr, hear our prayers and answer our petitions. Amen.